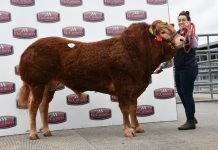 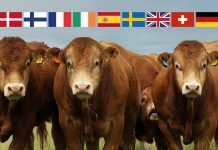 John Smith-Jackson, Hightown Farm, Melkridge, Haltwhistle continued a fantastic run of 2019 sales when taking the lead price of £5600, a centre record, with a Limousin sired heifer at Hexham & Northern Marts prize show and sale of store cattle with show ring potential held on 8th March. 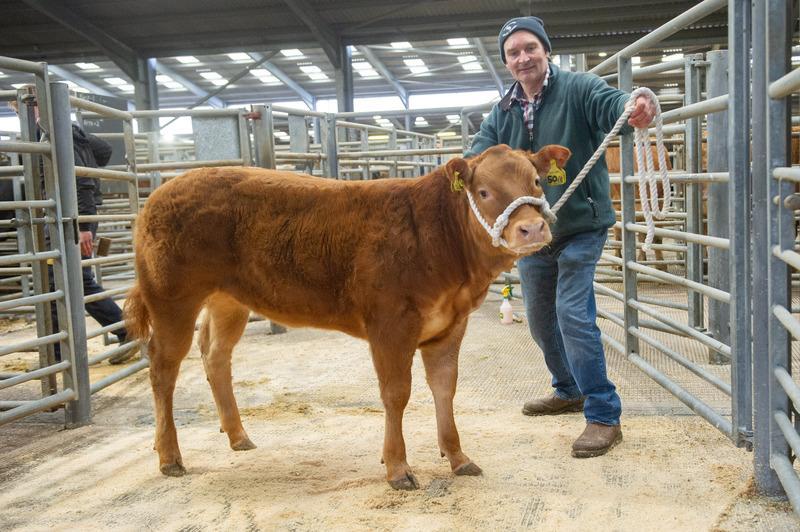 The sale followed hard on the heels of the Leyburn Spring Spectacular where Mr Smith-Jackson took the top price of £9200 with another Limousin sired heifer. 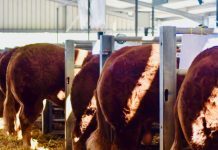 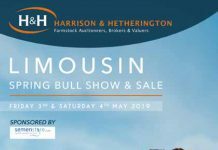 At both sales the top priced heifers were sired by the homebred bull Hightown Jacko, a son of Shire Apollo who has bred so well over the years for the Hightown herd. 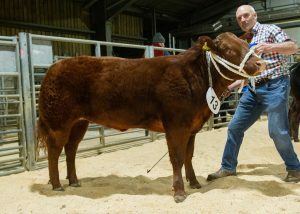 Described as ‘sweet and sparky’, this seven-month-old heifer caused much anticipation around the ringside. 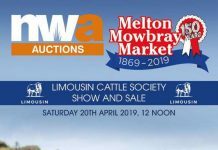 Setting off with a flurry of bids the heifer quickly surpassed the previous centre record of £4300 set in 2015 before going on to £5600 where it was knocked down to Messrs Wilkinson & Marwood, Leyburn, North Yorkshire. 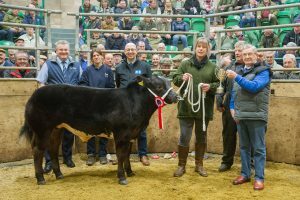 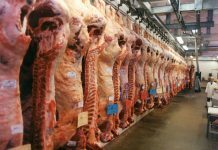 The pre-sale show was judged by the first ever lady judge at this event, Mrs Lin Calcraft, Honiton, Devon. 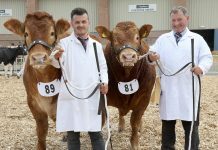 From the preliminary breed classes Mrs Calcraft selected her male and female champions and as the tension mounted these two were brought forward in contention for The John Davison Perpetual Millenium Trophy and the £1000 cash prize presented to the Overall Champion. 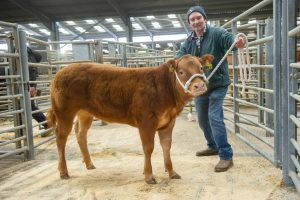 With two outstanding Tynedale bred calves stood before her the judge gave each animal her full consideration, before tapping out a Limousin cross steer calf from Messrs E Telfer & Sons, Newton High House, Stocksfield as her Overall Champion. 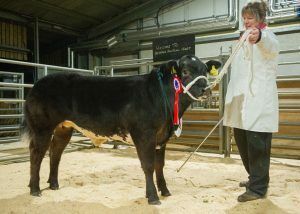 The steely-blue bullock at a little over eight months of age had been turned out by Malcolm Telfer & Helen Claxton having earlier taken the Male Championship and the ‘halter trained’ Limousin Steer Class first prize rosette. 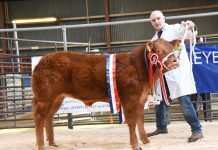 Without hesitation Mrs Calcraft was then swift to award the Reserve Champion rosette to the Female Champion calf which was a sharp and stylish red Limousin cross heifer just short of twelve months of age and another from John Smith-Jackson, High Town. 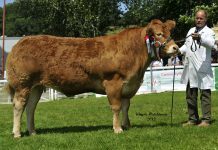 This one had previously taken the first prize rosette in the ‘unhaltered’ Limousin Heifer Class and headed up a four-strong team of calves from the Haltwhistle based exhibitor.